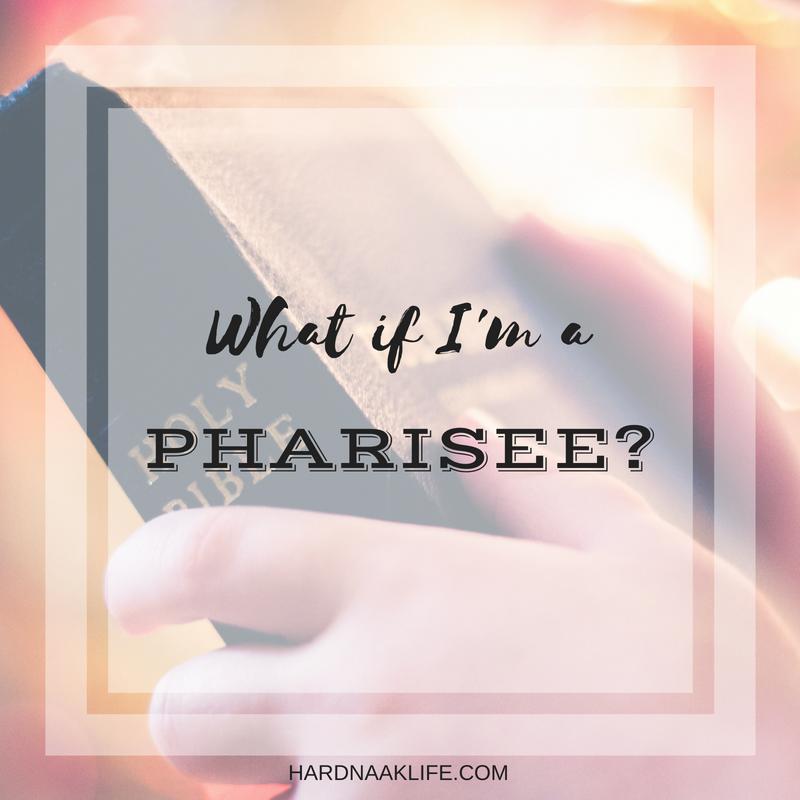 Hard Naak Life: What if I'm a Pharisee? 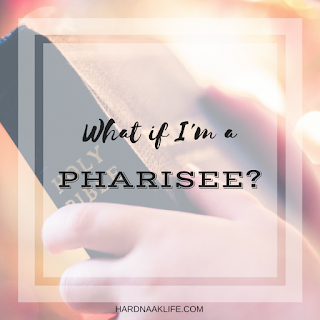 What if I'm a Pharisee? Who am I when no one is watching? That’s a question I ask myself often. I’m not going to lie, one of my worst fears as a Christian is that I’m nothing but a Pharisee. Specifically, a modern-day Pharisee who, much like his or her biblical counterpart, walks around like a whitewashed tomb. While clean and shiny on the outside, they have only death and emptiness on the inside. They’re great pretenders. They fill their Facebook page with scripture, but don’t love their neighbor. They sit in church every Sunday, but their hearts are far from God. On the outside, they’re neat and tidy, but on the inside, they’re a mess. A big, fake mess. Truth is, we’re all good pretenders. If I’ve been up at night with a sick child, I can guarantee the mom who visits my office to talk about her child’s grades has no idea I’m running on no sleep. When my friend stops in to talk about her bad day, she’ll have no idea I’m having a rough day also. It’s easy to put on a mask and hide things from the world around us. We are not transparent because we fear revealing our true selves and our true feelings. We also don’t want to burden those around us with our problems. But there is a fine line between pretending to protect ourselves and others and pretending to create a whole new persona. There seems to be so much pressure to fake our way through life and convince others we have it all together. That our lives are always happy, funny, ordered, clean, and to be envied. We portray ourselves and our circumstances as pictures of perfection. I’m guilty of being fake and pretending to have it all together, but as a Christian, I have a responsibility to be honest about who I am. It’s so easy to fake our Christianity to the outside world. To wear a mask on the outside, and be empty on the inside. In addition to that list of negatives, six times in the chapter He calls them out with the same strong-worded sentence. I can’t help but see myself. Christians, the world is watching. Our friends are watching, our families are watching, and most importantly, God is watching. How are we representing Christ to those who are not, as Paul refers to us, of The Way? And, my goodness, how are we treating our fellow brothers and sisters in Christ? God doesn’t want us to wear our religious masks and parade ourselves around as perfect people. Besides, masks don’t cover eye planks. It’s time we humbled ourselves and started taking our faith seriously. So how do we do this? How can we be genuine about our faith? Our faith as Christians starts with a heart change. When we decide to follow Jesus, really follow Jesus, we have an unmistakable change of heart. A changing of our heart of stone to a heart of flesh. As the Holy Spirit works in us, we bear good fruit. Pharisees work on how they present themselves to the world. Christians allow the Holy Spirit to work on their heart. Allow God to work in you and through you so you won’t be like the Pharisees. There is NOTHING you can do to earn your way into Heaven. Nothing you can do, nothing you can wear, nothing you can buy. It’s not about who your friends are or where you live. None of that will ever secure you a spot in eternity. Only the grace of God, that covers a multitude of sins, can save you. It’s time we all stop wearing masks and start being truthful to ourselves and others. What a burden it is to go through life telling half truths. If things are hard, tell someone. We need to embrace Galatians 6:2. Bear one another’s burdens and so fulfill the law of Christ. It’s so relieving when a fellow Christian is honest about their struggles, their fears, and their shortcomings. It’s how we truly come to know each other as fellow brothers and sisters in Christ. It also goes a long way toward building trust and genuine friendships. Be yourself, who God made you to be. Love God and love each other with genuine affection. Love this so . much! The Lord started this work in my about three years ago and it is a MUCH better life on the other side of it. Transparency and authenticity brings much deeper relationships with friends, but more importantly, with GOD! Blessings to you! I admit that I am a Pharisee..Its high time to accept and repent..